Central London office lettings in May 2014 reached 1.37m sq ft in 50 deals, driven by the signing of some large deals. The May figure puts 2014 back on target for 12m sq ft of medium/large office deals for the year. The City again led the way with over 500,000 sq ft of office deals, backed by 120,000 sq ft of Docklands deals ans a strong showing in London, SE1. The West End, helped by the Estee Lauder pre-let, accounted for over 300,000 sq ft of transactions. Financial services led the take-up by sector in the month, followed business services and retail related companies. A rise in new requirements, particularly by medium sized companies in the City of London is likely to feed through to more deals in future months. Metropolis is currently tracking around 7m sq ft of active central London searches. 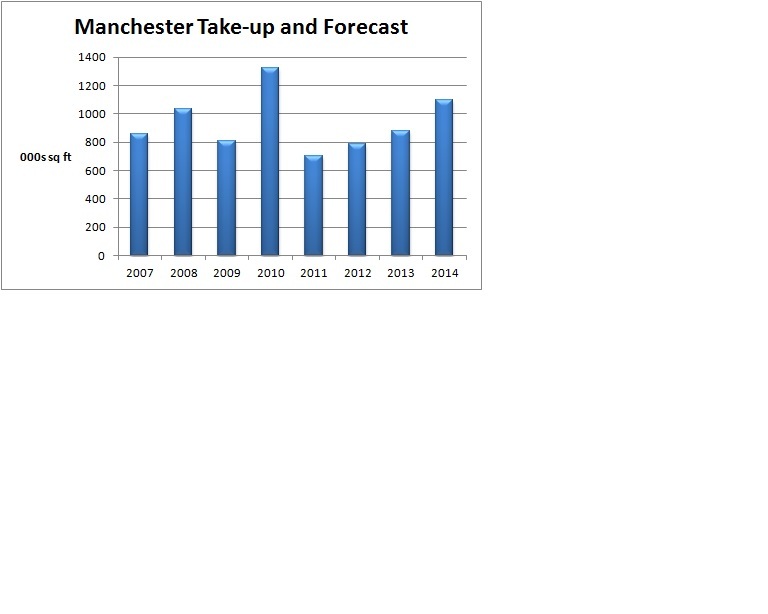 A recent report by Savills on the Manchester office market highlighted an increase in office take-up in Q1 2014. Office space transacted in Manchester rose from 215,000 sq ft in the last 3 months of 2013 to 317,000 sq ft in the first quarter of 2014 in 69 deals. Metropolis looks at recent deals and future forecasts. Barclays took 80,000 sq ft at Carlyle’s 4 Piccadilly Place scheme and Trader Media took 60,000 sq ft at Ask Development’s No1 First Street. Costain, the construction group, identified new regional office space of 3,437 sq m (37,000 sq ft) to relocate to at Goodman’s 1500 Aviator Way on Manchester Business Park. While Emirates Airways took 2,323 sq m (25,000 sq ft) at Goodman’s Building 1000, also on Manchester Business Park. Despite the large deals it is the smaller, often sub-5,000 sq ft, moves in Manchester, which make up the majority of the market activity. Local agents put this down to a two tier office market, which includes a large amount of second hand available office stock, whereas newly built or refurbished grade a stock is in short supply. Manchester’s national and international profile has enabled it to register around 1m sq ft of take-up every year. Local agents believe that there is close to 800,000 sq ft of requirements in the market in Manchester. Metropolis is currently tracking over 40 Manchester searches by local and national companies including PWC, Ticketmaster and Age Concern. If the current pace of lettings is maintained the office take-up total for 2014 could again top 1 million sq ft.